We are Spokane's only Jamaican food pit-stop and we pride ourselves on serving it up authentically. We use spices imported directly from the chef, Doc's, hometown in Jamaica. 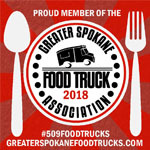 We had this idea to share Jamaican food with Spokane because of our loves for each location and for a lack of anything Caribbean in this area. Spokane has been good to us and we enjoy bringing just a little bit of Jamaica to the Pacific Northwest. We serve up regularly, jerk chicken and curry chicken with three sides on the menu of cabbage salad, rice and peas (red beans and rice) and festivals. To excite your taste buds, we have rotating weekly specials consisting of curried goat, jerk pork, whole fried fish, stewed oxtail, spicy honey citrus shrimp skewers, Jamaican style pork, and escovitch fish. We love catering events and have been honored enough to be apart of weddings, company lunches, and family reunions. Our location does vary so we ask that you check our facebook for precise locations and we hope to see you soon!